Same crepe batter (just used the leftovers), but this time filled with sautéed Kale, fresh pear, a smear of cream cheese and a drizzle of balsamic syrup. Just like yesterday, these are pretty quick to come together if you do a little bit of pre-planning. Make the crepe batter the night before, and keep it chilled up until you need to use it (do give it a good stir before you start making the crepes). Pull out the cream cheese too, if you are using it, so it warms a bit and is easier to spread. Make the balsamic syrup, and set it aside. Chop the kale and the pears. Place the pears in some slightly acidic cold water (a squeeze of lemon will do) to keep them from browning. 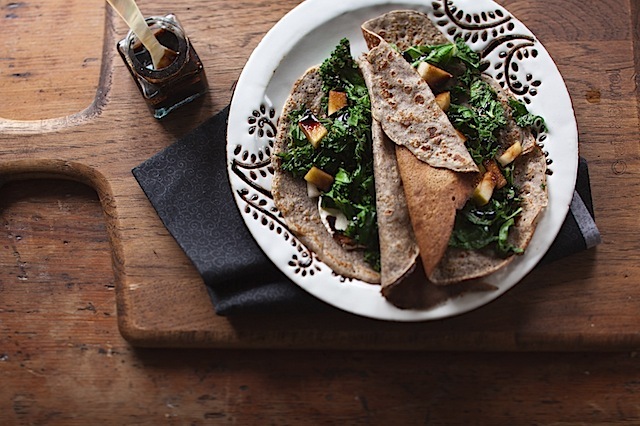 Make the crepes and set aside while you saute the kale (just a touch of oil and a very hot pan). I like to finish the kale with a squeeze of lemon juice and a little salt. To assemble, smear a small amount of cream cheese on a crepe, top with the kale and a sprinkling of pears and drizzle with the syrup. By the way, the balsamic syrup is a great addition to all kinds of things, and it’s really easy to make. Just combine 1/2 cup balsamic with a tablespoon of sugar, and heat to your desired consistency… actually, just a tiny bit thinner than what you’d like because it will thicken a smidge as it cools. It’s also the subject of my next Still Life With remake challenge… so stay tuned! This entry was posted in Breakfast, Cook and Eat, Food, Lunch, Recipe, Savory, Today I. Bookmark the permalink. What a lovely looking crepe! The balsamic syrup picture is pure gorgeousness. Both of these crepe posts look fabulous. I’ve made a caramelized onion, mushroom, feta pizza with balsamic syrup and it’s fabulous. That crepe looks and sounds divine! 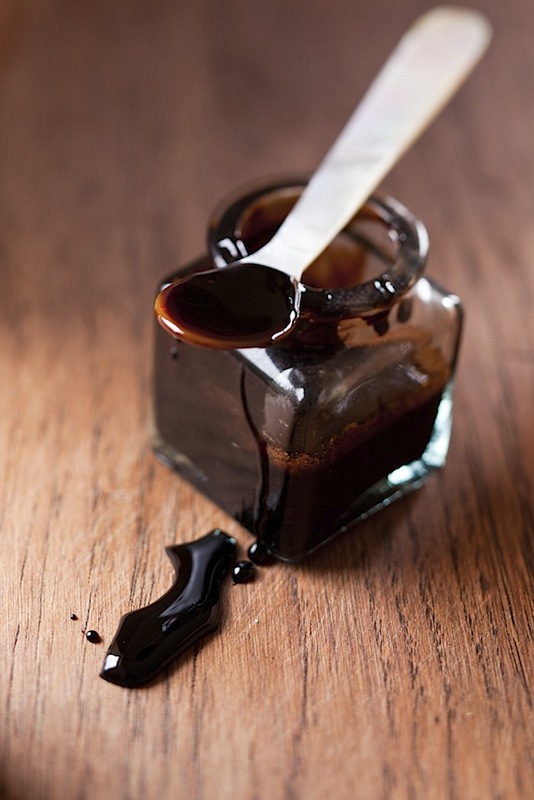 Balsamic syrup sounds like it would be very yum and handy to have in the kitchen! I’m really enjoying you blogging more often. Gorgeous pics, as always. I love the black napkin, it looks great against the brown. Balsamic syrup & crepes sound like such a great combination. Most people think crepes and their mind goes to whipped cream and strawberries.